The company was founded in 1987 by Chip Conley, then 26, after he became "disillusioned" with the corporate real estate market 2½ years out of Stanford Business School. Conley raised $1 million in 1987 to buy the decrepit Phoenix Hotel in San Francisco's Tenderloin neighborhood, where he opened the landmark restaurant Miss Pearl's Jam House with Joey Altman. Conley modeled the name after Esprit, the clothing company then based in San Francisco. Initially targeting traveling rock bands, musicians, and filmmakers, Conley met with travel agents throughout the United States, modeled the hotel's concept after Rolling Stone Magazine, and offered tour managers free massages to induce them to book their bands' stays at the Phoenix. A popular but not financial success, the hotel began to attract nationally known entertainers such as David Bowie, Linda Ronstadt, and Johnny Depp, even though the hotel was essentially a low-budget 1950s era motel. With support from investors, Conley bought a series of moderately sized, often run-down buildings, which he turned at low cost into boutique hotels, in each case creating a different "psychographic" concept such as new age wellness, men's health, romance novels, New Yorker Magazine, or luxury camping. 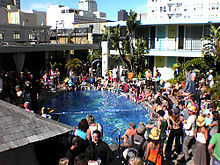 The company, which had been based in San Francisco, suffered a substantial downturn after 9/11 and the dot com crash, which affected San Francisco more than most other hospitality markets. With 22 capital calls from investors and cuts in executive salaries, the company survived and, rather than closing poorly performing properties or laying off staff, took advantage of lower commercial real estate prices to expand throughout California. The company also began to take over and control its hotel restaurants to reduce risk. As of 2008[update] the company owns more than 30 hotels, manages 6 others, and operates 18 restaurants, all within California. Among the most famous is the Ventana Inn in Big Sur, California. The Hotel Vitale, on San Francisco's waterfront, is the first hotel the company built, rather than bought from a previous owner. The company also expanded into managing hotels and condominium amenities for other owners. Starting in 2005 with Hotel Angeleno in Los Angeles, Joie de Vivre began expansion into southern California, and in 2009 opened Shorebreak Hotel in Huntington Beach, Hotel Erwin in Venice Beach, and Pacific Edge Hotel in Laguna Beach. In 2010, a majority stake of Joie de Vivre was purchased by Geolo Capital, the private equity firm founded by Hyatt Hotels heir John Pritzker. A $150 million fund to acquire additional hotels was established as part of the deal, with plans to acquire $300 million to $500 million in hotels over a three-to-five-year period. In September 2010, Joie de Vivre announced Gary M. Beasley, a partner at Geolo Capital, as its interim chief executive officer. With this appointment, founder Chip Conley became executive chairman and chief creative officer. In 2011, Joie de Vivre expanded outside of California converting the Hotel Theodore in Scottsdale, Arizona into The Saguaro. The following year in March, Joie de Vivre opened the Hotel Lincoln in Chicago. In October 2011, Joie de Vivre merged with Thompson Hotels, an international luxury hotel chain based in New York, with the two brands operating under a newly created parent company, Commune Hotels & Resorts. One of Thompson Hotels' founders, Stephen Brandman, was named CEO of the new company. Another Thompson founder, Jason Pomeranc, was named co-chairman along with John Pritzker. Chip Conley, Joie de Vivre’s founder, retained equity in the new company and remained involved as a strategic advisor. In May 2013, Commune Hotels & Resorts announced the launch of tommie, a value-oriented brand of hotels, with the first two hotels planned to debut in 2015 in New York City. In August 2013, John Pritzker purchased the rest of Commune’s stake from Jason Pomeranc through Geolo Capital, for an undisclosed sum, thereby gaining full control of the company. In March 2014, the company opened The Epiphany Hotel in Palo Alto, California. In 2016, Joie de Vivre no longer managed the Saguaro hotels both Scottsdale and Palm Springs, with management turning over to the Sydell Group. ^ a b c d George Raine (2008-04-27). "Joie de Vivre finds room to grow". San Francisco Chronicle. ^ a b c "Joi de Vivre Hospitality:On the Record: Chip Conley". San Francisco Chronicle. 2005-08-07. ^ James A. Martin (1989-04-09). "Phoenix Inn Is San Francisco's Funky Alternative". Los Angeles Times. ^ "TV Dinner: A Conversation with Joey Altman". Cooking With the Single Guy Chef. 2007-11-01. ^ Jennifer Reese (July 2000). "San Francisco's most accommodating fellow". Via Magazine. ^ "The Issue: When a CEO's Sacrifice Isn't Enough". Business Week. 2008-01-14. ^ "Hotels". Joie de Vivre Hospitality. Archived from the original on 2009-01-07. Retrieved 2008-11-22. ^ "Hotel Partners". Joie de Vivre Hospitality. Archived from the original on 2008-11-21. Retrieved 2008-11-22. ^ "Restaurants". Joie de Vivre Hospitality. Retrieved 2008-11-22. John Heilemann (2007-03-27). "Entrepreneur finds 'suite' dreams in hotels:Joie de Vivre's Chip Conley is building a hospitality empire by rethinking how hotels are designed, marketed, and sold". Business 2.0. Dan Levy (2004-12-26). "Signs of life in the tourism universe:High-end Hotel Vitale set to open as hospitality business picks up in S.F." San Francisco Chronicle. ^ Jesse Hamlin (2007-11-06). "Towering work of art". San Francisco Chronicle. ^ "Joie de Vivre Hotels Introduces Hotel Erwin". hospitalitynet.org. June 22, 2009. ^ Corbett, Peter (July 8, 2011). "New Drinkwater will reflect 'vibrant spirit of Southwest'". The Arizona Republic. Jones, Jay (April 2, 2013). “Hawaii: Spruced-up Shoreline Waikiki makes its Oahu debut.” Los Angeles Times. ^ "Here's how The Saguaro Palm Springs is changing". Retrieved 2016-09-28. ^ "Joie de Vivre Hotels". jdvhotels.com. Retrieved 12 December 2015.